Grocery shopping is a chore. It just is. We'll nevermind that it's a harder chore for me now because of my RA. We'll just go with it's a chore. 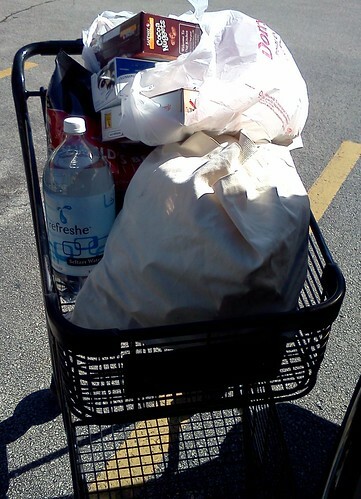 Shopping carts don't make it easier. They are big, often with bent wheels which make steering a job in and of its own. Or you get a wheel that locks occasionally so instead of rolling, you're shoving it through the store. They are deep and the under cart area isn't the friendliest place to shove kitty litter or a case of water or an 8-pack of toilet paper. Even without RA, lifting, twisting, turning, squatting just makes the whole process of purchasing comestibles almost more trouble than it is worth. But, within the last 3 years, the Dominicks near the office, where I do 90% of my shopping, has added these little carts. They are good for about 3 bags on top and a bag or two on the bottom. I really like them. First of all, they don't hold as much as a large cart. I am forced to shop only off my list because excess doesn't fit. This is good for the pocketbook, not so good for the manufacturer counting on my impulse purchase. Next, what you can't see is a basket below the handle. It's the perfect size for my purse or a couple of 2 liters. There is a hook where I can hang my purse if I need the basket for something else. These carts are light-weight and easy to push. The only drawback is there aren't enough of them. I suppose it's a balancing act. When I am stocking up, I want the large cart in spite of the depth and the difficulty I have in shoving things underneath. For those small trips that are bigger than a hand basket, this is wonderful. I will frequent a couple of other Dominicks in the area and I have never seen these there. I made a point, this last trip, to swing by the Customer Service desk and thank them for this size of basket. The guy behind the desk looked a bit nonplussed. I guess people don't compliment a store on their carts.